Principal Cast : Lily James, Michiel Huisman, Glen Powell, Jessica Brown Findlay, Katherine Parkinson, Matthew Goode, Tom Courtenay, Penelope Wilton, Bronagh Gallagher, Kit Connor, Andy Gathergood, Florence Keen, Nicolo Pasetti. Fraught post-war melodrama turned mystery flick, the unwieldy title of The Guernsey Literary & Potato Peel Pie Society shouldn’t put you off watching: no, the clumsy second half and uneven focus should. A film that tries to be one part romantic drama, another part wartime parental mystery, and an idyll to rural British island life, Guernsey turns itself inside out without much success at any of it, although it should be noted the top-line cast do not disappoint. Rather, the story’s harsh backdrop and the bucolic direction by director Mike Newell strike an imperfect balance that never gels, although not through lack of conviction. London-based war author Juliet Ashton (Lily James – Baby Driver) has carved a career out of writing under a male pseudonym, making her and her publisher Sidney Stark (Matthew Goode – Stoker) very wealthy. 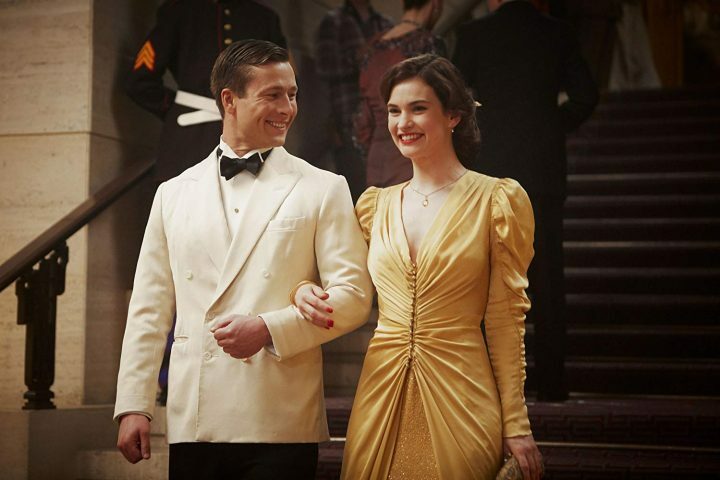 The war is now over, and Juliet finds herself communicating with a stranger from the British island of Guernsey, a former German outpost during the war, about the uniquely named Guernsey Literary & Potato Peel Pie Society, and its surprising origins. After becoming engaged to beau Mark Reynolds (Glen Powell – Hidden Figures), Juliet travels to Guernsey to write about the Society, and meets members touched by the horrors of the German occupation. She begins to fall for local farmer Dawsey Adams (Michiel Huisman – The Age Of Adeline) and attempts to unravel the mystery behind the whereabouts of Dawsey’s young daughters’ mother, Elizabeth (Jessica Brown Findlay – Victor Frankenstein), who was arrested by the Nazi’s and taken to the continent. In doing so, Juliet lifts the festering scab on the Society’s fearful secret, a secret many – including the tragic Amelia Maugery (Penelope Wilton – The BFG) – do not want made public. Guernsey (I refuse to type out that entire title each time) is a film trying to be so many things that it never quite figures it out. The film begins as a genteel wartime mystery of the Society’s origins (which is quite amusing, if not a touch genius) and eventually becomes a search for a missing mother, with the cloistered local denizens of 1940’s Guernsey Island having to learn to trust a complete stranger following the German occupation, something they’re reticent to do. The overall premise of Guernsey is intriguing (although buried behind an impenetrable title) if not a little maudlin, and if you’re expecting some frothy romance movie you’ll find little to really enjoy – star Lily James’ flirtations with co-star Michiel Huisman’s rugged farmboy character are enjoyable, but hardly revelatory. What transpires is a film that takes us on an unintended journey, with James forming a counterweight for some terrific ensemble dramatic acting, particularly Penelope Wilton’s embittered, grief-stricken Amelia, who lost both her daughter and her grandchild in a German bombing raid on the island. Wilton is the emotional centrepiece of the film, which is amazing considering her relatively smaller role in the overall story, and the actress’ ability to transform into a haunted, wastrel of a woman lamenting her lifetime of loss is considerably memorable. The titular society, including Tom Courtenay’s Elben Ramsay, Katherine Parksinson’s Isola Pribby, and Huisman’s Dawsey, is a cluster formed from adversity, and the mutual affection each member of the gang has for the other is naturally pleasant, and you get the feeling that you’ve kinda known these people all your life when you meet them. As the movie progresses, however, the story transitions from a film about the Society into a mystery within the Society, as simmering frustration, anger and distrust threaten to boil over as Juliet overturns many long-dormant rocks. It’s during the transition that the film takes a turn for the worse. Oh, it’s eminently directed and acted, sure, and the film’s production value is gorgeous, despite apparently never stepping onto Guernsey itself during filming. The landscapes of the film’s island lifestyle are beautiful, the photography employed by cinematographer Zac Nicholson is terrific, and Alexandra Harwood’s accompanying score is both soothing and appropriately thematic. But the soul of the film turns rancid as Juliet’s digging for the truth delves deeper, and the romanticised opening half suddenly becomes a nastier, less accessible depiction of human sadness, much of it unearned. The film trades on simplistic iconography to engender emotional weight (the sight of Nazi solders beating Polish and Jewish slaves on the island, in particular, sours the film utterly at a key backstory moment), something I found a little disingenuous, to be honest. I felt manipulated at times, with the shroud of melancholy thrown over me mercilessly as the angst and bitter agony of war pierce an otherwise enthusiastic romantic melodrama. If nothing else, the film is a showcase for the delightful Lily James, who floats through this movie with grace and poise beyond her years. It’s taken me a while to really warm to her as an actress, but in Guernsey she shows her moxie alongside some considerable talent and I was hugely impressed with how much heft she gave to the role. It’s not a role of deep complexity, really, especially compared to the supporting cast she’s surrounded by, but James own the part and shoulders the film’s soft-focused glow with ease. 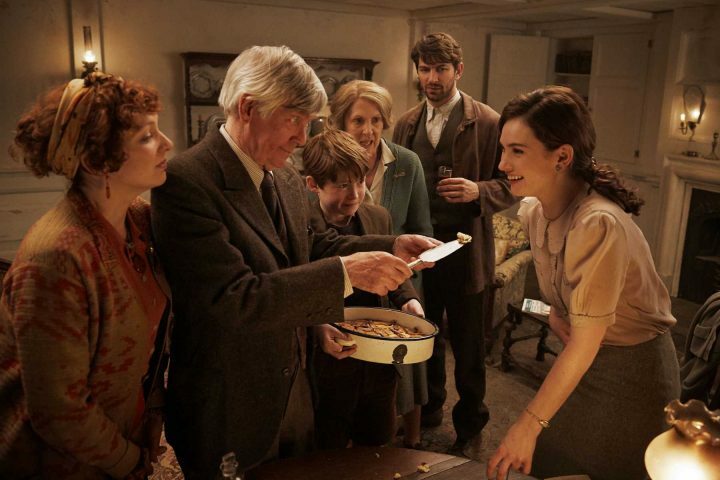 Matthew Goode’s Sidney Stark is a delight, Glen Powell’s straight-arrow Mark is the thankless third wheel, and Tom Courtenay’s Elben is an instantly memorable geriatric, while smaller parts to Parkinson, as the mournful Pribby, and Bronagh Gallagher as a snooping busybody, make for beguiling residents on the island. It’s an actors film, really, although Guernsey would be a far better movie had they got the balance of drama, pathos and sorrow right. 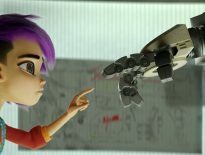 Unfortunately, whilst I can hand-on-heart say I enjoyed the film to a degree, the sum of its parts don’t manifest into a cohesive, powerful whole. A confused sense of purpose robs a lot of the film’s intent, despite Newell’s best efforts, and while the romantic subplot caves in below the Nazi horror of the film’s central theme, a lengthy running time finds the pacing running aground too often to resurrect. Beautifully shot, well acted (especially by James and Wilton) and delivering a warmly nostalgic look at a dark period in British history, The Guernsey Literary & Potato Peel Pie Society’s unstable focus and meandering sense of purpose undermine an otherwise competent period piece that ought to have knocked it out of the park.